The Shapeoko 3 is a heavy duty desktop CNC machine designed to do real work, out of real materials like non-ferrous metals, hardwoods, and plastics. 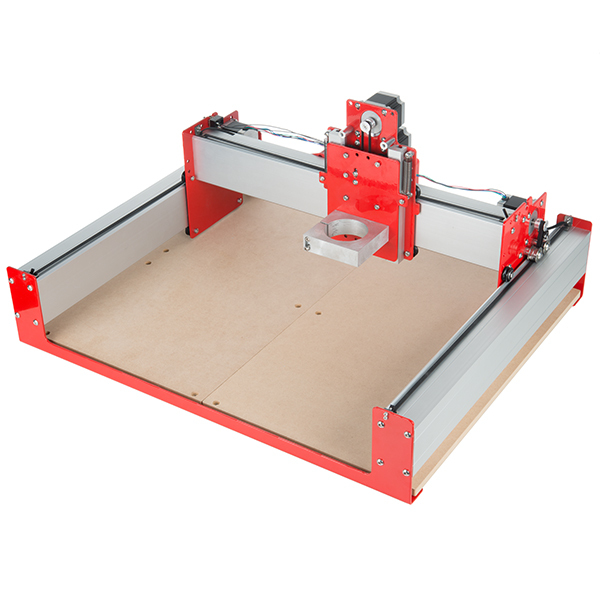 This special SparkFun Edition of the Shapeoko 3 CNC Machine Mechanical Kit includes the base frame and assembly hardware (screws, nuts, pulleys) to build the physical structure of your CNC. 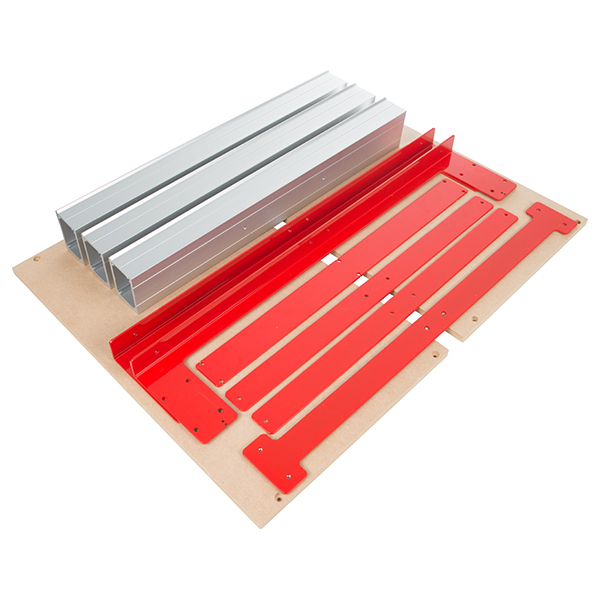 If you are looking to build your own custom gantry or wanting to upgrade an existing setup to a bigger platform check out this kit. 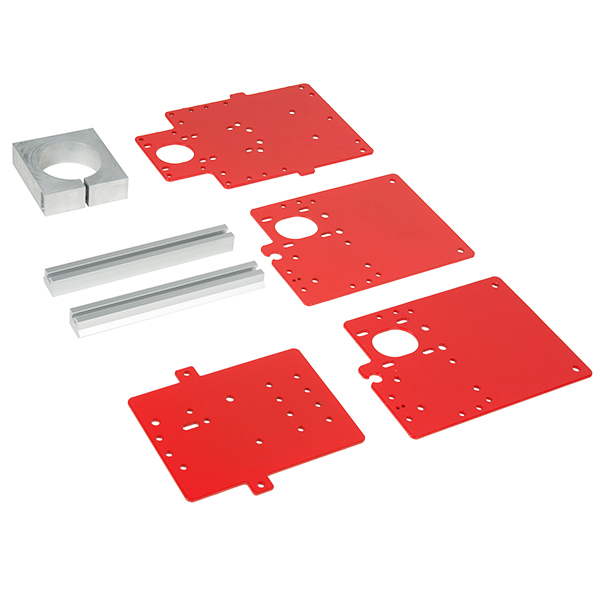 This mechanical kit has a cutting area of 425mm x 425 mm x 75mm (16" x 16" x 3") and an overall footprint of 725mm x 600mm (28.5" x 23.6"). It should be emphasized that as this is the Mechanical Kit, it does not include any motors or electronics nor will you find a spindle router, power supply, or control software. If you are looking to purchase a more complete CNC machine, check out our Shapeoko Deluxe Kit. In case anyone was purchasing this thinking it was open source and they could later make the machine any size they wish, this is definitely not the case. Official from Rob at Carbide that the extrusion is proprietary and will not be sold alone so your either stuck at your 16"x16" or forced into one of their upgrade kits in a size they determine and when they decide to release. I was sold on an open source machine and this is not. Just a caution to anyone else. The machine is a great hobby machine if your happy with the current size limitation. One can now upgrade the machines a bit, new XL (~33"(X), ~17"(Y), ~3"(Z)) and XXL sizes (~33"(X) x ~33"(Y) x ~3"(Z)) are now available on the Carbide3D site. Why is SparkFun lowering it's standards and selling closed-source stuff like this Mechanical Kit? Take a close look at that repository and you'll find only one drawing for one of these parts, and that drawing has no dimensions. That is not a mistake, Shapeoko intentionally never ever published the drawings of this kit, only open-sourced elements are electronics and software, key parts needed to make this machine are missing and kept closed. Shame on SparkFun for supporting such an attitude by selling this kit. I haven't checked if every piece is there, but it seems pretty open to me. Please note that the file(s) below were preliminary, in advance of the formal released plans and are kept for reference. Also note how many part are there on other picture here: https://cdn.sparkfun.com//assets/parts/1/1/2/0/3/13713-03.jpg Not there is no drawing of the assembly, there is not even a parts list, link on that page to "Parts List (unofficial)" links to a dead Dropbox link. Let's not beat around the bush, the same story repeats for each and every Shapeoko machine, the drawings of the previous version is available when the next machine is released, and previous one becomes obsolete. That was the case with Shapeoko 1, 2, and now is the case with 3. It was released many months ago and drawings are still not there. Only thing that surprised me is that SparkFun agreed to this game. This is Edward - I started and still run Shapeoko as part of Carbide3D. You're plain wrong about basically everything you've said. Drawings for Shapeoko 1 and Shapeoko 2 were released as soon as I had time to clean them up and bundle everything together. The machine, just in the last few weeks has been marked as 'released' and out of pre-order phase. We're not 'hiding' the drawings from anyone. The license on the mechanical kit is CC-BY-NC, just like on the Standard Shapeoko 3 sold by Carbide3D. I'm not wrong in anything except that drawings exist buried in the Dropbox zip file linked only from the forum topic, that topic is at this moment on the second page of topic listings of "Shapeoko 3 Assembly" subforum inside of "Get Help!" subforum [!?!?!] of the Shapeoko forum. If you do not consider that deliberately hidden when Shapeoko has regular GitHub repository with other less important parts, then I don't know how you define hidden. 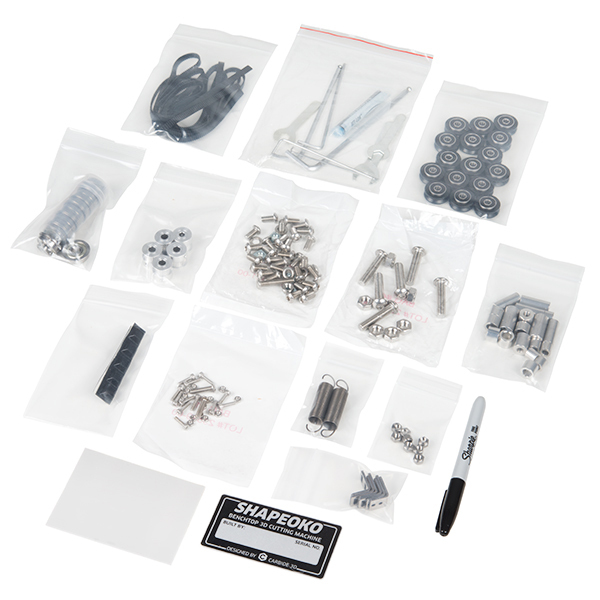 We all know that this Mechanical Kit is 90% of the price of the Shapeoko Deluxe kit, so please don't play naive. The same was always the case with Shapeoko 1 & 2, and inability to find the drawings until the next version was released was what kept me from Shapeoko. Naive is not something I play. Your non-sequiturs are making your statements hard to follow. Using terms like 'always the case' isn't good practice when there are literally 1,000s of Shapeoko users who can attest to the availability of files. As I said before - S3 is very recently 'officially released' as we're not making active changes to the design and the machine is in-stock and not on pre-order. The files should be bundled up and available through an easier to find link very soon. Regardless of all of this, clearly this machine isn't for you, and that's OK. Unless Carbide3d is claiming to be an open source company, this is really a non issue. Many open souce companies have used non open source products: arduino.cc, adafruit, sparkfun, and the open source companies that choose to include a raspberry pi (too many to list). I wish there was a fully open mill built on open hardware (I may have to design one), but until there is one a partially open mill, is a pretty good choice. The drawing for both the ShapeOko 1, 2 and 3 were all available on the wiki or linked from there, shortly after the release of each. Getting a 404 error on the assembly guide link. Where did you find a repo with a drawing? I have a Shapeoko 2 and the drawings for it were really good. But you might be right, I can't find a full set of drawings for this version. Sorry, we were playing with file names when we shouldn't have been. All fixed.